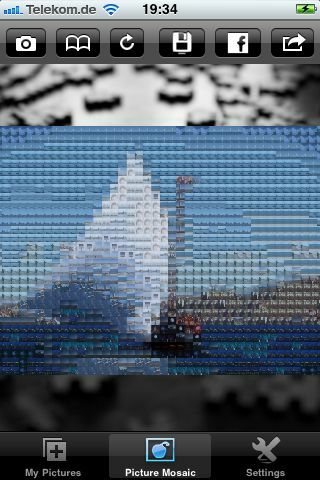 MyPictureMosaic is a photography app that takes your pictures and obscures them by transforming them into mosaics. It was developed by Groovy Apps for an iPhone or iPod Touch with iOS 4.0 or later and costs $1.99. At first I was skeptical about this app, but I have since been blown away by its capabilities. It functions by taking a photo—either preexisting or taken from within the app—and uses all of the photos that you have uploaded into MyPictureMosaic to construct a mosaic. When you initially open up the app, you are prompted to upload pictures into it. Generally, the pictures you upload will be everything from your photo library. Any pictures you upload are stored in the My Pictures section of the app. You can then toggle to Picture Mosaic in order to start playing with your pictures. You can either take a photo or choose one from your device’s stored photos. In Settings you have the ability to manipulate the mosaic style. You can control the number of tiles used, which runs from 15×15 to 100×100, you can control the maximum mosaic size, running from 600×600 to 3000×3000, and you can turn color correction on and off. If you wanted to get a clearer visual of the photo being mosaicked, then you would increase the number of mosaic tiles being used and decrease the maximum size of the mosaics. If you have set the tile size to its maximum potential and you have chosen a picture to mosaic that has skin tone colors, you may want to keep in mind that the app will draw upon any nudes you may have taken with your phone that are stored in your photo library. I am just suggesting that you keep that in mind if you have constructed a particularly beautiful looking mosaic picture that you were considering emailing to your mom. You can either email the finished product, save it to your device, or upload it to Facebook. MyPictureMosaic is a blast and I cannot stop playing with it. I love setting the mosaic size to maximum and zooming into the picture to pour over the amalgamation of photos used to construct the mosaic. AppSafari review of MyPictureMosaic was written by Vanessa Paszterko on November 17th, 2010 and categorized under App Store, Art, Fun, Photos, Social. Page viewed 4946 times, 1 so far today. Need help on using these apps? Please read the Help Page. This is GREAT! I can now have a photo mosaic without doing it manually. I really love creating photo mosaic, thanks for this. This apps allows you to create artistic photographic mosaics composed of a variety of photos. It is the first app in the AppStore that offers the possibility to create mosaics based on your own photo library.